Â Good morning! It’s time for another trip into my musical teenage canon with Tune in Tuesday! I’m really enjoying this meme that Ginger of GReadsBooks has organized and I hope that you are too! It’s been very therapeutic and just funny what the mind remembers! Since I’m being all open about my disasterious love triangles, here’s a fun one. The crazy time when I had a major crush on my boss at work and he had a crazy girlfriend who hated me just because I worked in the same store. That’s just the innocent part of the story too. And you’ll see from the handful I chose to share with you, he was definitely doing the same thing. Don’t some of these just make you want to swoon? I’m glad I can listen to them now and not feel so sad anymore. P.S. Yes, I was obsessed with boys. 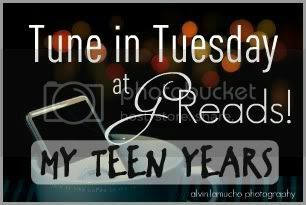 I’m so excited to take part in GReads’ Tune in Tuesday this month for an excellent theme: songs I listened to when I was a teenager. This is going to be so much fun and — I am just imagining — incredibly angsty. Oh the joys of high school. Pre-iPod! Listening to mix cassette tapes on band trips, exchanging mixes on CDs, and how a lot of my music taste was influenced by songs I was twirling to in band. Oh geez… I think I have to go write in my journal now. haha. Oh high school.